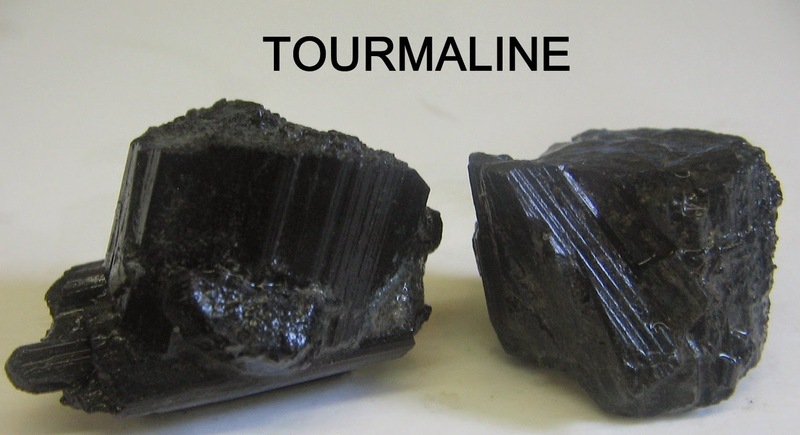 Tourmaline belongs to a complex family of aluminum borosilicates mixed with iron, magnesium, or other various metals that, depending on the proportions of its components, may form as red, pink, yellow, brown, black, green, blue or violet. Its prismatic, vertically striated crystals may be long and slender, or thick and columnar, and are uniquely triangular in cross-section. They often vary in coloration within a single specimen, lengthwise or in cross sections, and may be transparent or opaque. The name Tourmaline comes from an ancient Sinhalese word turmali, meaning “a mixed color precious stone,” or turamali, meaning “something small from the earth. Tourmaline is a shamanic stone, providing protection during ritual work. It can be used for scrying, and was traditionally used to point out a cause of trouble or an offender, and to indicate a good direction in which to move. To use Black Tourmaline in purification and protection rituals, create a ring of eight small natural tumble stones for a protection circle or place upon an altar. Black Tourmaline defends against debilitating disease and strengthens the immune system, heart, and adrenal glands. It also is beneficial in treating the bowels, constipation, IBS, and diseases of the colon, as well as ridding the body of heavy metal toxins and environmental pollutants. Black Tourmaline is a stone of purification, cleansing the emotional body of negative thoughts, anxieties, anger or feelings of unworthiness. It helps in overcoming substance abuse, and releases any suicidal thoughts or self-harming tendencies. It may be beneficial in treating obsessive or compulsive behaviors, and in relinquishing chronic worry. Natural Tourmaline wands are considered quite special and channel a high-powered electrical energy capable of transcending physical laws and producing phenomenal healing. The positive force of these Light tools effectively clears blockages in the aura and removes negative energy. Black Tourmaline wands may be placed at the knees or feet with the terminations facing the toes to direct negative energies out of the body. They can also be used to direct energies from the crown and ethereal body to the base chakra, re-balancing the meridians of the physical body and providing an optimal balance in the ethereal body.